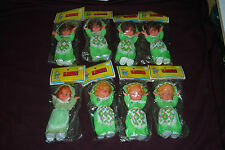 Your bidding on a lot of 8 vintage NOS Dime Store Karen Dolls measuring approx 7.5". 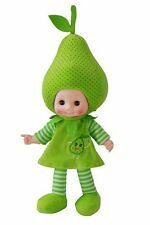 There are three variations of the doll with Blond, Brunette, and a Strawberry Blond with a clothing variation. 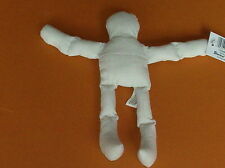 This is a lot of 6 NEW stuffed muslin doll bodies, 8" tall, that are ready to dress or decorate. Pink Check Celli Cat 1pc. Excellent: The item and or piece of jewelry has evidence of wear. Very Good: The item and or piece of jewelry has small flaws that are not usually noticeable during wear. However, the rhinestones may be yellowing or beginning to turn gray (dark spots are visible looking into the stone). Blings Season2 Cookie Puppy Baby Doll. Size : 25cm / 9.8in (H). Contaact Us. If you are not satisfied with our product or service. Creative and beautiful Hawaii flamingo them design make your cake or party decoration more pretty. 6 x Topper 2 x Banner. This item is manufactured with premium paper material. The delicate design and creative pattern will ensure its practicability and popularity as a cake toppers and banner uses. 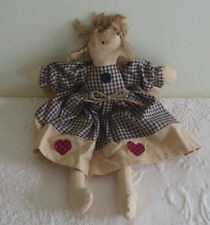 Hand-made textile doll made off a portrait. If you need larger quantities than what we have listed. Let us know and we will try to accommodate you. These have fabric fangs. These say on the box Voodoo doll Poupee De Vaudou Have left Krazy Town. On the back of the box it states Not your average doll, voodoo dolls were once together as a very tight knit clan in a far away place known a s Krazy Town. BT21 PLUSH DOLL (STANDING DOLL) KOYA. BTS BANGTAN BOYS Official Goods. Exact sizes might be different by characters. Manufacturer : LINE FRIENDS Corp. It's very limited edition. It may take up to 8 weeks due to strict custom inspection. BT21 PLUSH DOLL (STANDING DOLL) CHIMMY. BTS BANGTAN BOYS Official Goods. Exact sizes might be different by characters. Manufacturer : LINE FRIENDS Corp. It's very limited edition. It may take up to 8 weeks due to strict custom inspection. BT21 PLUSH DOLL (STANDING DOLL) COOKY. BTS BANGTAN BOYS Official Goods. Exact sizes might be different by characters. Manufacturer : LINE FRIENDS Corp. It's very limited edition. It may take up to 8 weeks due to strict custom inspection. BT21 PLUSH DOLL (STANDING DOLL) VAN. BTS BANGTAN BOYS Official Goods. Exact sizes might be different by characters. Manufacturer : LINE FRIENDS Corp. It's very limited edition. It may take up to 8 weeks due to strict custom inspection. Qty: 20pcs. Item Size: About 6cm. Lot 10 sets blank matryoshka doll with 5 pieces. Handmade, original and very nice art. Height 9-10 cm (3 2/3in). This matryoshka doll was made in the city of Vologda (near of Moscow), which has a famous and recognizable style. They were hand-written russian author. Cute Kewpie Doll Baby Vintage Cameo Figurine Rubber Ornament Japan Toys 5 pcs 2"
Enjoy the adorable Kewpie doll. Gifts, Collection, Handicraft & DIY, Children toys. I has acquired the trademark as "Obitsu Kewpie". 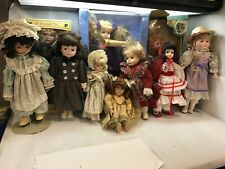 Supplied Contents : Kewpie Doll 5 pcs. Model : Stand Kewpie Dolls. 2018 Blings Kids Season2 Frog Baby Doll. Size : 20cm / 7.8in (H). Country of Origin : Korea. If you are not satisfied with our product or service. 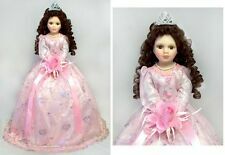 2018 Blings Kids Season2 Cat Baby Doll. Size : 20cm / 7.8in (H). Country of Origin : Korea. If you are not satisfied with our product or service. Blings Season2 Muffin Bear Baby Doll. Size : 25cm / 9.8in (H). We are willing to respond to your inquiry. They include different animals and Peruvian folk art characters. 2018 Blings Kids Season2 Rabbit Baby Doll. Size : 20cm / 7.8in (H). Country of Origin : Korea. If you are not satisfied with our product or service. Lot 20 sets of small blank matryoshka doll, each set contain of 3 pieces. You will receive 20x3 = 60 pieces of different sizes, smaller pieces are entering inside of larger ones. 2018 Blings Kids Season2 Parrot Baby Doll. Size : 20cm / 7.8in (H). Country of Origin : Korea. If you are not satisfied with our product or service. 2018 Blings Kids Season2 Penguin Baby Doll. Size : 20cm / 7.8in (H). Country of Origin : Korea. If you are not satisfied with our product or service. The clothes is suitable for 1/6BJD,blythe,pullip,azone,licca,lati,ob,Jerryb. 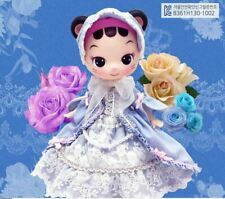 Only the colored plaid dress (1pcs) included,dolls and other accessories not contained.